The long journey to the greatest prize in the Scottish junior game begins on Saturday when the first round of the Scottish Junior Cup takes place. And although many clubs received byes when the draw was made, there are a number of cup crackers in store. Kilsyth Rangers got the junior equivalent of the ‘Ross County away’ draw when they were handed a trip to Burghead Thistle, the most northerly junior club in the country. Rangers boss Keith Hogg won junior game’s blue riband trophy twice with Linlithgow Rose and has seen his side make an excellent start to his season’s Super League First Division campaign with four wins out of four so far. He said: “I have been fortunate enough to get my hands on the trophy twice and it’s a fantastic experience. “We’ve spoken to a couple of people who have played against Burghead and they have told us they are a good team with a good stadium and playing surface. Meanwhile Bellshill Athletic, face opponents a little closer to home when North Lanarkshire rivals Wishaw make the short journey to Rockburn Park to provide the opposition in the first Scottish tie played in Bellshill since the club returned to the town during the summer. David Lilley’s side have found the going tough since stepping up to the Super League again following last season’s promotion while Wishaw sit in mid-table in the Central First Division. A tough test awaits Bellshill’s local rivals Thorniewood United who travel to face East Superleague side Bonnyrigg Rose while Central Second Division table toppers Lanark United are also away at East Region opposition in Crossgates Primrose. There’s another local derby in Angus where Montrose Roselea will take on Forfar Albion in a what should be cracker of a clash. Camelon have been drawn away to Irvine Vics and Broughty Athletic also head to Ayshire to take on Cumnock. Tayport have been handed an away tie at Lochee Harp while another Fife side, Newburgh, have a home tie with Kilbirnie. 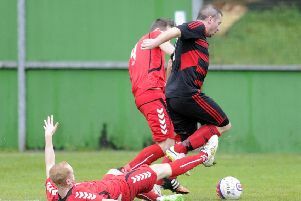 Neilston Juniors are at home to Dufftown. One side not involved are Linlithgow Rose who have the small matter of a match in the mainstream Scottish Cup away to Gala Fairydean Rovers. All ties kick off at 2.30pm.